Three weeks into our Mend Our Mountains crowdfunding campaign, and your response has been superb, with over £35k raised so far. But we set ourselves a minimum target of £100k when the campaign ends on 9 May, so if you haven’t already made a donation, please think about doing so. Spring into summer with a Snowdon T-shirt; if you’ve climbed it, covet it or just like admiring it, then you’ll love wearing one of our terrific new limited edition BMC T-shirt tributes to Yr Wyddfa. Want to know what we achieved in 2015? 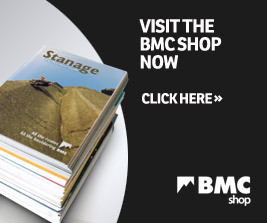 Our annual report presents some of the highlights of the working year in an easy-to-digest format sprinkled with facts and figures; it's out in time for the BMC AGM and Annual Gathering in the Peak District. Join us for a packed programme of events. 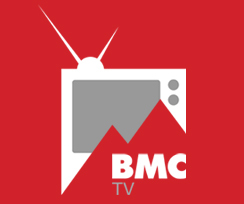 Sir Chris Bonington, Doug Scott CBE and Julia Bradbury are supporting a major new British Mountaineering Council (BMC) crowdfunding campaign launched today to raise money for environmental projects on some of Britain’s most iconic peaks: Mend Our Mountains. The BMC's hill walking ambassador Chris Townsend is one of the world’s most respected experts on long-distance walking. In this 'how to' interview, he offers tips for getting started with extended hikes, reveals his next goals, and shares some thoughts on windfarms, camping bans in Scotland and other topical issues. The alpine season has a habit of creeping up on us and being here before we know it. Advance planning is the smart way to make your alpine dreams come true. We asked Calum Muskett to share five things he wished he had known when he first started out. Competitors flocked to climbing walls around England, Wales, and Ireland on 19 March 2016, packing these venues full of the UK's next top climbers for the third round of the BMC's Youth Climbing Series of 2016. Our top pick of the action-packed Sheffield Adventure Film Festival (ShAFF) weekend was Saturday’s gathering of inspirational and adventurous people at the BMC Women in Adventure (WIA) network event, where the winner of our WIA film competition was revealed. Calling all experienced indoor lead climbers. 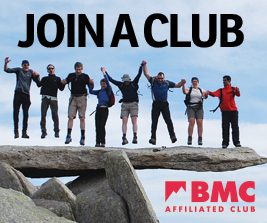 Learn how to climb outdoors on sport routes, under the guidance of an instructor, for only £30. It's back after a 32-year long hiatus! North Wales welcomes the Women's International Climbing Meet 2016, brought to you by the Pinnacle Club and the BMC. Nepal’s recent spell of bad luck even saw tourists cancelling trips after the recent release of the ‘Everest’ movie. But before the country’s recent woes, trekking tourism in one of Nepal’s most iconic destinations, the Annapurnas, was already suffering from a self-inflicted wound – the area’s first road. Read on for more of this insightful update from outdoor author Terry Adby. Did you know that you can do a lot of things with a sling? Need to build a belay or improvise a chest harness? With a bit of know-how you can do it with a sling. Read on to discover more about slings, and what you can do with them to help you climb more safely. Want to know what we achieved in 2015? Our annual report presents some of the highlights of the working year in an easy-to-digest format sprinkled with facts and figures.